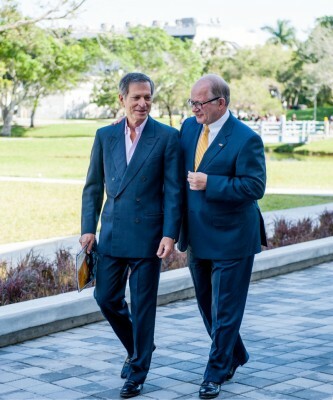 FIU has named its School of International and Public Affairs in honor of Ambassador Steven J. Green. Green, along with his wife Dorothea Green, daughter Kimberly Green and the Green Family Foundation, has made a $20 million gift to help propel the Steven J. Green School of International and Public Affairs forward as one of the world’s top academic centers dedicated to international understanding, economic development, peace, and security. In furtherance of the Green Family’s commitment, FIU has also renamed its Latin American and Caribbean Center to the Kimberly Green Latin American and Caribbean Center and established the Kimberly Green Scholarship and Dorothea Green Lecture Series Fund. During his term as U.S. Ambassador to Singapore from 1997-2001, Green spearheaded strategic programs that enhanced U.S.-Singapore alliances in economic development, intellectual property, immigration and national security. Now, the international philanthropist, businessman and former CEO of Samsonite Corp. will lead the efforts of The Green School’s Strategic Advisory Board to involve top philanthropic, political and diplomatic leaders throughout the world. As part of the gift, an endowment will be established to support academic, research and public affairs initiatives focused on transnational studies, international institutions and security policy in the Americas. The gift will also support the construction of a state-of-the-art building that will help unify all of the school’s resources into a single location, fostering collaboration, interdisciplinary innovation and student success by providing space for cutting-edge research, diplomatic meetings, international gatherings and more. The gift will also support the school’s pursuit of membership in the Association of Professional Schools of International Affairs (APSIA). As catalyst donors at the university for nearly 25 years, the Green Family has helped shape FIU by supporting The Steven and Dorothea Green Library and the Frost Art Museum, creating art lecture series, and preserving history through the Digital Library of the Caribbean. They also forever changed the way FIU teaches medicine through the university’s groundbreaking Green Family Foundation NeighborhoodHELP in the Herbert Wertheim College of Medicine, where students work with medically under-served families throughout Miami-Dade County. Ambassador Green has received numerous awards and recognition for his commitment to FIU, including an honorary law degree from FIU in 2009. Dorothea Green, a former Miss New York and former member of FIU’s Foundation board, is the founder of FIU’s Steven and Dorothea Green Critics’ Lecture Series, and recently published a personal travel book, My World by Water. Together, Steven and Dorothea founded The Green Family Foundation in 1991 as a private, nonprofit organization dedicated to supporting social programs that positively impact global health and alleviate poverty. Kimberly Green, an accomplished philanthropist, writer and documentary-filmmaker who holds a Doctor Honoris Causa from FIU currently serves as the foundation’s president. Under her leadership, the foundation has spearheaded a variety of initiatives in Haiti and in her native Miami. Congrats! I’m excited for the opportunity to engage in lectures & forums that are open to the community. As the program grows, I recommend that students be encouraged to attend events and engage in your forums/lectures/events. Many are disconnected on campus and would gain much from having a broader understanding of our complex world. Mr. Green, Lady Green & Daughter Green …….. My salute to you all for such a great contribution to FIU SIPA. It’ll help FIU to broaden knowledge of SIPA students to provide world leaderships in order to alleviate poverty, injustice, discrimination, a terror free world including global security.